City Hall was the venue for ‘Spring Online’ today – a free event for older people to enhance their digital skills. Belfast City Council teamed up with Go ON NI, Department of Finance, BBC Northern Ireland, Business in the Community and other organisations to provide workshops on going on the internet, using social media and online banking among other areas. The BBC NI Digital Bus was also parked in the grounds to show the public how they can make the most out of apps and offer guidance on how to keep digital devices safe with internet security. 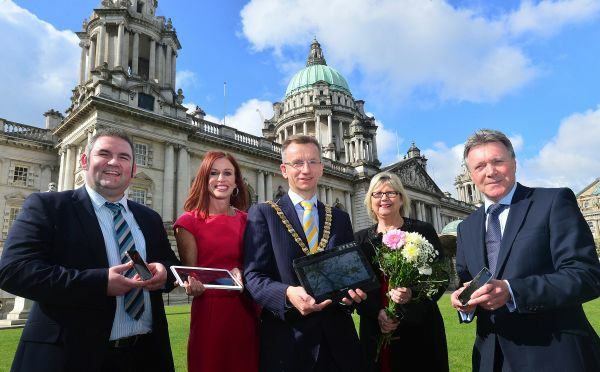 Opening the event, Lord Mayor, Alderman Brian Kingston, said: “Events like ‘Spring Online’ show that Belfast is taking a lead role in connecting our citizens with the latest technology and ensuring our services continue to be accessible to all so that nobody is left behind. A celebration ceremony took place inside City Hall for participants of the Intergenerational Connect IT Project which brought students and older people together during the year to share and learn new digital skills. Certificates were presented by the Lord Mayor to pupils of Little Flower Girls’ School and Ashfield Boys’ School who shared skills with older people in the city’s community centres. As part of the event, there was also a Tea Dance and the Old Cinema Club showing archive footage of Belfast.